Abstract. 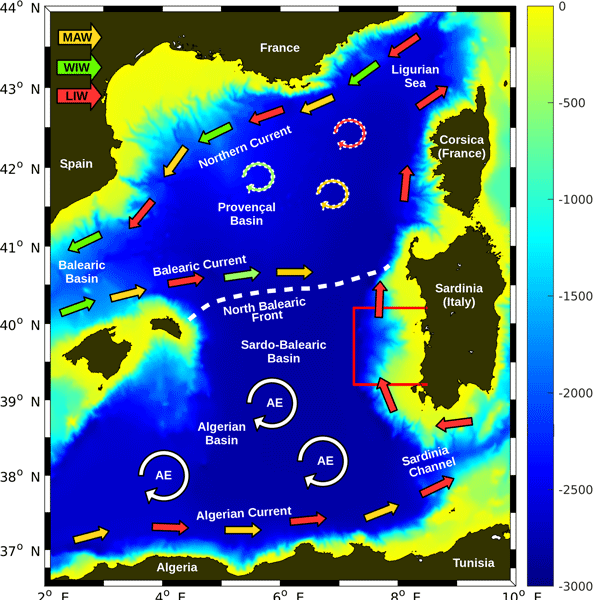 The observational part of the REP14-MED experiment was conducted in June 2014 in the Sardo-Balearic Basin west of Sardinia (western Mediterranean Sea). Two research vessels collected high-resolution oceanographic data by means of hydrographic casts, towed systems, and underway measurements. 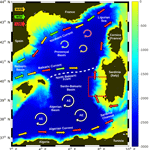 In addition, a vast amount of data was provided by a fleet of 11 ocean gliders, time series were available from moored instruments, and information on Lagrangian flow patterns was obtained from surface drifters and one profiling float. The spatial resolution of the observations encompasses a spectrum over 4 orders of magnitude from 𝒪(101m) to 𝒪(105m), and the time series from the moored instruments cover a spectral range of 5 orders from 𝒪(101s) to 𝒪(106s). The objective of this article is to provide an overview of the huge data set which has been utilised by various studies, focusing on (i) water masses and circulation, (ii) operational forecasting, (iii) data assimilation, (iv) variability of the ocean, and (v) new payloads for gliders. How to cite: Onken, R., Fiekas, H.-V., Beguery, L., Borrione, I., Funk, A., Hemming, M., Hernandez-Lasheras, J., Heywood, K. J., Kaiser, J., Knoll, M., Mourre, B., Oddo, P., Poulain, P.-M., Queste, B. Y., Russo, A., Shitashima, K., Siderius, M., and Thorp Küsel, E.: High-resolution observations in the western Mediterranean Sea: the REP14-MED experiment, Ocean Sci., 14, 321-335, https://doi.org/10.5194/os-14-321-2018, 2018.